AppleCheeks Diaper is the softest diaper on the market, and as they know you LOVE the styling of their Envelope Cover, so they've translated the design to a product that really works - Washable Swim Diaper! One layer of fine dernier knit and one layer of 100% polyester Canadian-milled mesh allows water to comfortably move through the diaper while keeping any solids, should they occur at an inopportune time, out of the pool. 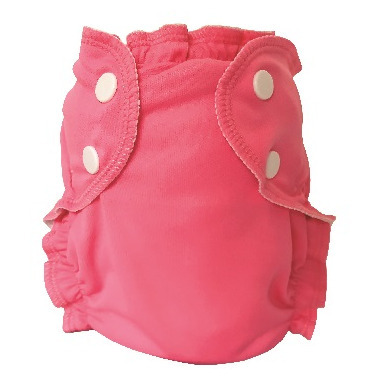 AppleCheeks Washable Swim Diaper is completely designed and manufactured in Montreal, Quebec, Canada, just like the rest of the AppleCheeks™ line. Their signature two-size system with a snap at the waist and a separately adjustable snap at the thigh means your little one is guaranteed a comfortable, long-last fit. Size 1 fits approximately 7lbs - 23lbs and size 2 fits approximately 20lbs - 35lbs.